Logan Square artist Gwen Zabicki is founder of the South Logan Arts Coalition, which is accepting artist applications for free studio space until Feb. 1. 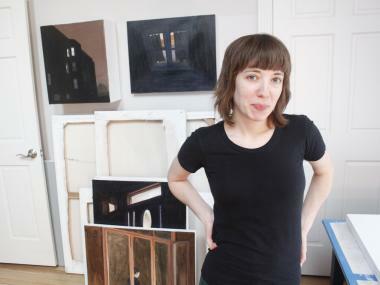 LOGAN SQUARE — When Gwen Zabicki finished her master's of fine arts in painting at University of Illinois-Chicago last spring, she noticed a disturbing trend. Most of her graduating classmates, she said, were moving to Los Angeles and New York City. Part of the reason, she said, is a lack of clean, affordable and ready-to-use studio space. So when the Logan Square artist, who grew up in Andersonville, noticed the empty storefronts lining stretches of Armitage and Milwaukee, she decided to marry supply and demand. Her nonprofit organization, the South Logan Arts Coalition, wants to persuade commercial property owners to donate their empty storefronts as free studio space, which the group will grant to neighborhood artists for one to three months. 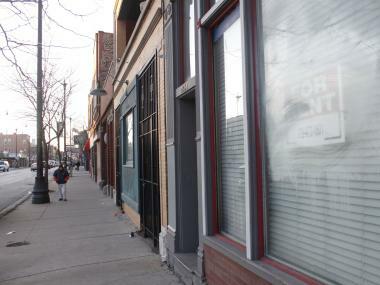 Stretches of Armitage Avenue are lined with empty storefronts, which SLAC hopes to turn into artist studios. The deadline for the first round of artist applications is Feb. 1, and Zabicki is working with the city’s Department of Cultural Affairs and Special Events and the Logan Square Chamber of Commerce to secure the first storefront studio spaces. After frustrating early attempts to convince individual owners to temporarily donate storefront space, Zabicki struck on a more likely solution: banks that own foreclosed properties. Zabicki said she’s in negotiations with banks for the use of two foreclosed storefronts on Armitage. Other groups, like Edgewater Artists in Motion, have turned empty storefront windows into pop-up art galleries displaying art for sale. Julie Burros, director of programming at Chicago’s Department of Cultural Affairs, said she wasn’t aware of other programs like Zabicki’s, aside from the 21 Artists project that will allow a series of artists to use an empty storefront on Madison for a single day apiece in February. “We love to see this type of grassroots energy originating in the neighborhoods,” said Burros. Only artists who live in Logan Square are eligible to apply for the spaces through the SLAC website. Successful applicants will need to pay a security deposit and possibly some utilities for use of the studio space, Zabicki said. On Armitage between California and Kimball, empty storefronts abound, sometimes three or four in a row. Zabicki said she believes that if she can convert even a few of those spaces into temporary studios, she can help keep artists from leaving Chicago. If she has her way, Zabicki will be that champion.